Hey, it’s Brad Montgomery with a tip about how to get the most return on your professional speaker or motivational speaker investment. Here’s the tip: consider experience over celebrity. So here’s, the deal, there’s two types of speakers. Okay, there’s more than two types of speakers, but if you kind of blur your eyes there’s two types of speakers. One of them are professional speakers, people who do this all the time. And the other one are celebrity speakers, people who have done something that’s amazing and now are talking about it. Well I’m going to confess to you there is one huge advantage to celebrity speakers. If you’re trying to build your audience, celebrity can help. So for example, if you’re an association and you’re not sure about how many people you can get to your event, sometimes hiring a celebrity will be enough of an add to get people to come to your event. So that’s a good point, I can’t say anything about that. But I’d really like you to think long-term. Don’t think about this years conference; I want you to think about next years conference and the year after that. One of the best ways to get people to next years conference is to make sure that this years conference rocks. And my suggestion to you is a killer speaker, period, is going to be better than a mediocre speaker, and generally speaking I think we can agree that experienced speakers are better than inexperienced speakers. So I want you to consider that. Listen to this quote of a real good pal of mine, another professional speaker told me that he was having a chat with the meeting planner, and the meeting planner told him, “Well you know what, we use the celebrities to bring the audience in, but we use people like you to make sure that the conference is good.” That’s a pretty good thought, isn’t it? I mean that’s a pretty deep thought, the meeting planner is confessing that in their experience celebrity speakers generally are not as good as full-time professional speakers, you know. So look for experience. How are you going to know about experience? Ask. When you’re considering hiring a motivational speaker I want you to ask this question, “Tell me about your experience.” And if they say, “Well, you know what, I’ve done some really, really amazing things in my lifetime up to this point. Now, you know, I’ve done it four times,” that’s a hint. I want you to ask another follow up question, “And what experience do you have in my niche, in my industry for audiences like mine?” And if they say, “None, I’ve never done it,” I want you to follow up with that, because your audience not only deserves, but really as time goes on and our audiences become more media savvy, they require a professional speaker who completely gets them and they will see a fraud, somebody who doesn’t understand them or their audience, them or their distresses, their problems, their joys, their job. They will understand, they hate that and they’ll turn on you. Trust me, I’ve seen it. So I’d love to be your guy. I’m not a celebrity. I’m not famous. But I’m good, and I’d love to be part of your team. Give us a call and we’ll talk about how we can help you and your association, your meeting, your conference get to where you want them to be. Bradmontgomery.com or you can find us at funnymotivationalspeakers.com. Have a great day. 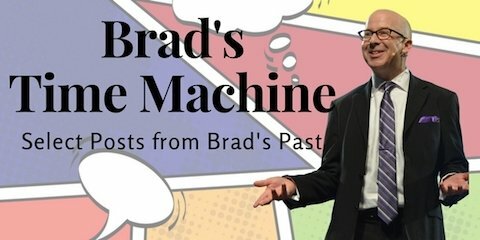 https://www.bradmontgomery.com/wp-content/uploads/2018/11/logo-1-495x198-1-300x120.png 0 0 Brad Montgomery https://www.bradmontgomery.com/wp-content/uploads/2018/11/logo-1-495x198-1-300x120.png Brad Montgomery2011-09-29 09:30:412018-05-25 05:47:24When Should You Choose an Experienced Motivational Speaker Over a Celebrity Speaker?